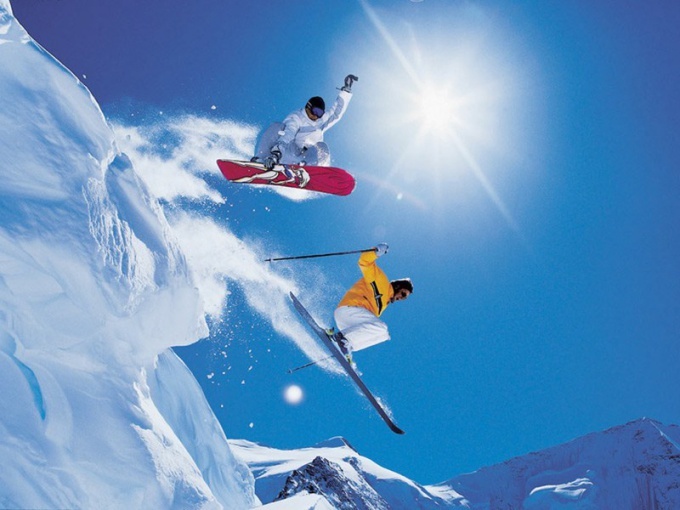 Skiing and snowboarding is a favorite pastime of many people who are not afraid to take risks. Rapidly descend down a huge snowy mountain under force not to everyone. But some people are so fond of winter sports that you are ready to deal with them even in the summer. Skiing is one of the oldest methods of transportation. Some historians are of the opinion that romance appeared in the stone age. Proof of this are the cave paintings, which depict primitive men on skis. The word "ski" comes from the Icelandic word "skid", which means "snow shoes". In Scandinavia the ancient Lapps were called "sliding". They believed in the goddess of the skis, and the God of winter, depicted on skis with curled toes. The first skis looked like long curved frame, made of animal bones, they were attached to the foot by straps. Today, skiing is not only a way of transportation, it is a very developed sport. Part of skiing includes snowboarding. Lovers of winter sports are not worried about the closing of the winter season. They know that on the other side of the world only winter is coming and so the season of skiing and snowboarding. You only need to choose a country that boasts some excellent ski resorts. Australia is a popular destination for skiing and snowboarding. Particularly famous resort "Kitzsteinhorn", located at an altitude of 3,029 metres. In Australia you will find many resorts offering slopes for professionals and beginners. There you will find trainers, is available for a fee to teach you all the basics of skiing or snowboarding. Visiting the resort "Perisher blue" (Australia), located about 6 hours drive from Sydney, you will be able to ski on seven mountain tops. All these vertices are connected by 49 lifts. France can boast of the Grand Motte glacier (Tina). There you can select one of the 16 lifts. You will see an artificial Park with all facilities for snowboarding. In Las Lenas (Argentina) you will be able to ski down the mountain, with a height of 3,657 meters. The resort is a 3-hour drive from Santiago (Chile). Switzerland – the country winter resorts, you can choose any to your taste. One of the best resorts in the world is considered a "Portillo", located in Chile. This is a unique place, open 50 years ago, can be found within a 2-hour drive from Santiago. It is high in Andrah, on its slopes typically ride in a day no more than 450 people. If you still do not know how to ski, almost all these resorts you will be able to learn lessons from experienced instructors. If you will be traveling in New Zealand, be sure to visit the ski resort "coronet Peak". In this picturesque place you can ride from morning to late evening. There is also the highway M-1 Big Easy, the length of which reaches up to 2.4 kilometres. It is suitable for professional and experienced skiers.